Last weekend I finally started working on the 1930’s quilt I mentioned a while back. 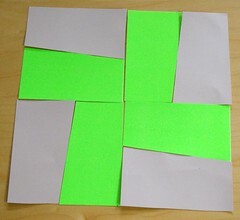 First I made a sample out of cardboard just so I would have an idea of how the blocks would look like. After cutting out all my pieces I made a sample block out of spare fabric. The quilt blocks for the actual quilt weren’t going to be mismatched fabrics but I still got a good idea of the size and the final look. After chain-piecing all my blocks I ended up with 25 blocks. 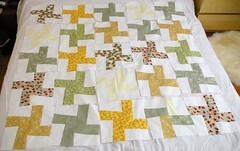 Each block is 10″x10″ so just the blocks along make a nice 50″x50 quilt top. I tried a few different layouts and these were the main contenders. The general consensus is that the gradient layout is the most interesting. It’s also my favorite, so I’m quite happy with it. Next up I have to decide on sashing and borders and buy fabric accordingly. I hope to have a finished quilt top next weekend! If you’re not interested in making your own quilts like me but would like to win your own, go check out Old Red Barn Co.‘s blog. She’s currently giving away a beautiful quilt with fabulous fabric from designer Sandi Henderson for Michael Miller fabrics. It’s the second time that she’s giving away a quilt and although I didn’t win last time I will try again this time! If you would be interested in winning this quilt yourself, make sure to go here and leave a comment! There’s nothing hard about that! My contest ends tonight! Make sure to get your entry(ies) in! The winner will be announced as soon as I can! your quilt is looking great. I so wish my new sewing machine and i were friends. I just so miss my old one, silly i know. I though of yuo the other day when i received some glass mushroom beads, smile. Am thinking stitch markers. I love your quilt its turning out so cute. 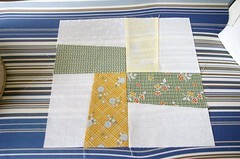 Are you going to quilt it yourself or have someone do it for you?? both verison of your quilt looks great! My heart & minds yerns to be more crafty but my hands are just too lazy. :)! The quilt is beautiful…you are very talented! hey girlie, i would love your addy to mail something your way, just for fun. my email is moonhonu@yahoo.com. thx!! Love the gradient…and love that vintage yellow! That color is in the running for a new color for our living room. 🙂 Can’t wait to see the finished quilt!